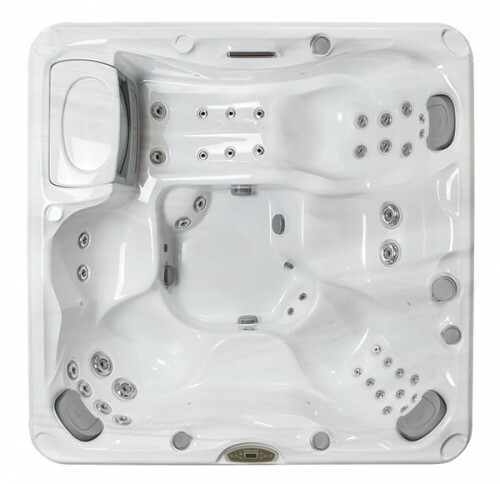 With room for up to six adults, the Hamilton™ spa features a lounge seat and adjustable patented Fluidix® Jets nestled into a variety of specialized seats to help you create your perfect backyard oasis. The larger dimensions of this model make the series-exclusive spiral-action lounge seat perfect for long legs. A series-exclusive Accu-PressureSeat™ relieves tired muscles, stress and tension through deep-tissue pressure. An open footwell also makes it easy to move around and socialize while still allowing tired feet to find relief with foot jets placed in an asymmetric dome.